The MAVEN mission was designed to last two years in space, but the spacecraft is still operating normally. With the mission managing its fuel to last through 2030, NASA plans to use MAVEN's relay capability as long as possible. The MAVEN orbiter carries an ultra high-frequency radio transceiver — similar to transceivers carried on other Mars orbiters — that allows it to relay data between Earth and rovers or landers on Mars. The MAVEN spacecraft already has served occasionally as NASA’s communication liaison with the Curiosity rover. Aerobraking plan for MAVEN. (left) Current MAVEN orbit around Mars: 6,200 kilometers (~3,850 miles) at highest altitude, and an orbit period of about 4.5 hours. 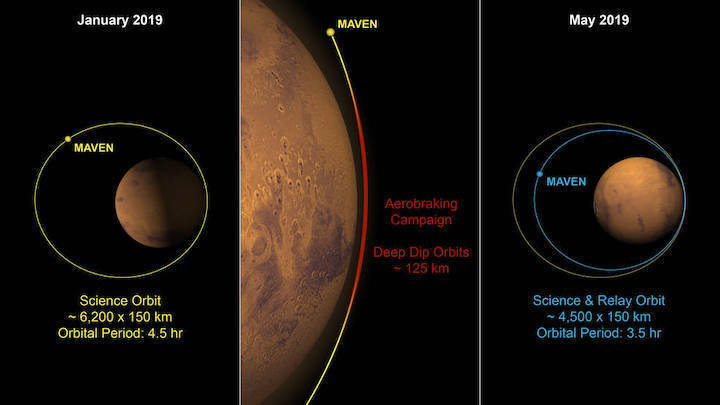 (center) Aerobraking process: MAVEN performs a series of “deep dip” orbits approaching to within about 125 kilometers (~78 miles) of Mars at lowest altitude, causing drag from the atmosphere to slow down the spacecraft. Over roughly 360 orbits spanning 2.5 months, this technique reduces the spacecraft’s altitude to about 4,500 kilometers (~2,800 miles) and its orbit period to about 3.5 hours. (right) Post-aerobraking orbit, with reduced altitude and shorter orbit period.